Mosquitoes are in the same group of insects as flies. They have one pair of wings and undergo complete metamorphosis (egg, larva, pupa, and adult). There are a couple of ways that you can help keep these pests out of your home. Screened windows and doors are a great start. Also, it is important to keep the vegetation around your house pruned. Dense shrubs and vines serve as shelter for these pests. Also, the pruning will allow more sun to penetrate the canopy of plants making them less attractive as resting sites. Lastly, keep your gutters clean and in good repair. Mosquitoes will breed in standing water that remains for long period of time. 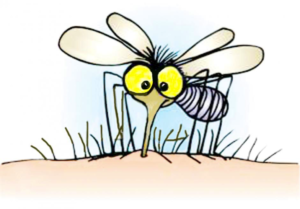 If you are still having problems, then you may need to consider mosquito control. Moyers Lawn Service and Landscaping is now offering the application of an All Natural Product (Tick Killz) to used to help kill, control, and or repel Ticks, Fleas, Mosquitoes, Gnats, Ants, Aphids, Centipedes, Chinch Bugs, Earwigs, Millipedes, Mites, Spiders, Whiteflies, and many other insects outside your home. We believe that this product is better than using a synthetic product. The tradeoff is that more frequent applications may be required. We will apply this product for you every 3-4 weeks – although it may be re-applied as often as desired.